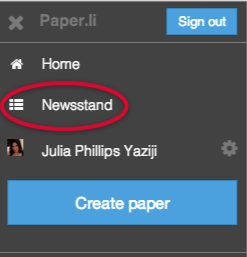 If you don't know the URL of your paper, click on the Paper.li main menu icon (upper left) to view the menu. You must already be signed in to view the menu. Clicking on "Newsstand" in the menu will bring you to the search menu shown below. (a) Enter the paper name, publisher twitter name, publisher email or publisher first and last name in the above search window and click enter. (c) Click either Papers (if you have entered a paper name) or Users (if you have entered a publisher name, twitter name, email, or facebook name). The search results will be shown below.